GitHub - sleemanj/mootools-filemanager: A filemanager for the web based on MooTools that allows you to (pre)view, upload and modify files and folders via the browser. Want to be notified of new releases in sleemanj/mootools-filemanager? Pull request Compare This branch is 113 commits ahead of cpojer:master. hideOnSelect: (boolean, defaults to true) If set to false, it leavers the FM open after you've clicked the select button, allowing for faster interaction when selecting multiple images. listPaginationAvgWaitTime: (integer, defaults to 2000) When non-zero, enable adaptive pagination: strive to, on average, not to spend more than this number of milliseconds on rendering a directory view. This is a great help to adapt the view to match the power of your clients' machines. standalone: (boolean, defaults to true) If set to false, returns the Filemanager without enclosing window / overlay. thumbSize4DirGallery: (integer, defaults to 120) The thumbnail image size in pixels of any thumbnails shown in the directory gallery view (detail pane, i.e. 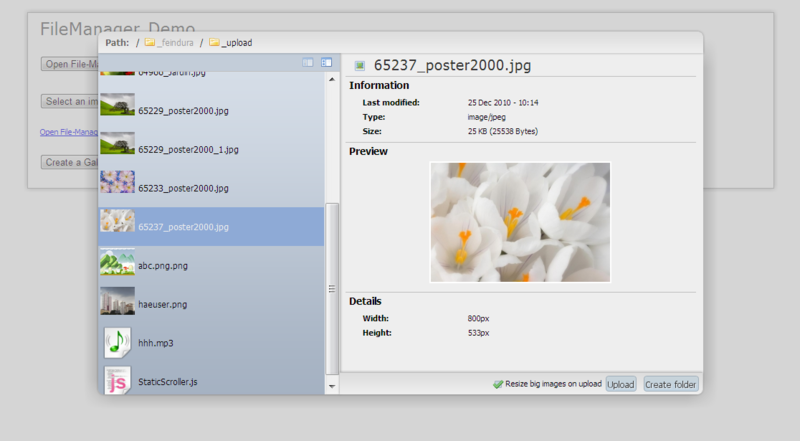 right panel); you can reduce network traffic quite a bit by picking '48' as the thumbnail size as the file manager will pick the small (48) or large (250) thumbnails produced by the backend, depending on this configured size. uploadTimeLimit: (integer, defaults to 260) The maximum number of seconds any single upload may take. This is forwarded to the Swiff.Uploader as the 'timeLimit' setting. uploadFileSizeMax: (integer, defaults to 2600 * 2600 * 25) The maximum number of bytes any single upload can be. This is forwarded to the Swiff.Uploader as the 'fileSizeMax' setting. Note that the backend option 'maxUploadSize' is the decisive factor; this is merely a user assist value. onComplete(path, file, fm_obj): fired when a file gets selected via the "Select file" button. Note that 'path' is already HTML encoded for direct use in tags, etc., while the file object contains all available metadata including references to and sizes of both thumbnail sizes produced by the backend. onModify(file, json, mode, fm_obj): fired when a file gets renamed/deleted or modified in another way. 'mode' tells you which of these fired the event: mode = 'destroy', 'rename', 'move' or 'copy'. MTFM_NUMBER_OF_DIRLEVELS_FOR_CACHE (default: 1) the number of directory levels in the thumbnail cache; set to 2 when you expect to handle huge image collections. Note that each directory level distributes the files evenly across 256 directories; hence, you may set this level count to 2 when you expect to handle more than 32K images in total -- as each image will have two thumbnails: a 48px small one and a 250px large one. As Flash and therefore the Uploader ignores authenticated clients[*] you need to specify your own authentication / session initialization. This is taken care of by FileManager itself, so you don't need to bother, except provide a tiny bit of custom code in the "UploadIsAuthorized_cb" callback function on the serverside, manually initializing and starting your session-based authentication. [*] More specifically: Flash does not pass along any cookies of itself, hence the FileManager will place the cookies in the GET URI query section for extraction by the server. You may pass along additional (key, value) elements to the server during upload by adding those items in the 'uploadAuthData' options' section. These will all be passed along in the GET URL query section. Any (key, value) elements included in the "propagateData" options' section are sent to the server as part of every request URI (action) and will show up in the $_GET array, where you can extract them. FM now provides a server-side callback hook for each request so you can apply your own business logic to determine if a given (file or directory, user context) mix is indeed permitted to be viewed / detailed / thumbnailed / uploaded / created / deleted / moved / renamed / copied / downloaded. These hooks can be configured as part of the server-side options for the Backend/FileManager instance. For more info and a sample see the Demos/manager.php and Demos/selectImage.php files.